LONDON, England -- The England squad and thousands of fans travelling to see them in the Euro 2012 football finals are under threat of a terrorist attack, according to intelligence sources. 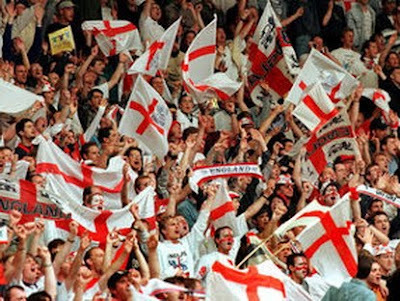 Thousands of England fans will be travelling to Euro 2012. The tournament is being jointly hosted in Poland and Ukraine. The latter’s intelligence agency the SBU – formerly the KGB – has warned of “possible biological terror attacks in Ukraine and especially their threat on the eve of the European Football Champ­ionship 2012”. The warning, reported by the Ukrainian News Agency, was revealed by a source in Ukraine’s National Security and Defence Council which is drawing up preventative measures against ­possible biological strikes involving the plague, cholera and TB. England are to play all three group stages in the ex-Soviet state in June at Donetsk and the capital Kiev. He specifically warned about the risk of tuberculosis, which is, in any case, rife in Ukraine and has a “high probability” of infecting fans. Bohatyriova said: “I feel an urgent need to inform the deputy prime minister Andriy Klyuyev about the high probability of infection of guests of Euro 2012 with resistant forms of TB,” and added that the disease in Ukraine “is on an African scale” with a rise in “incurable” strains. Officially, 457,000 people in Ukraine suffer from TB but some experts insist the true figure is about a million. As many as 4,135 people died in 2010 and 3,613 in the first six months of 2011, a significant upward trend. It is not the first time that the SBU has warned about the threat of terrorist strikes linked to Euro 2012. The deputy chief of its anti-terrorism centre Volodymyr Orativskyy warned of the magnet of the “massive inflow of participants and fans, the presence of VIPs, especially public officials”. He warned of the risk from “radical Islamist organisations” stressing that he has taken advice from the FBI and NATO. In a rare interview, he said: “There are supporters of ­ter­- rorist and ­religious extremist organisations banned in some countries. “There is a surge in migration from unstable countries." "We have hazardous industrial and energy facilities and host diplomatic missions of countries actively involved in counter-terrorism." “There is also an upsurge in extremism verging on terrorism in Ukraine." Another government fear is that opposition groups could use the tournament as a focus for protest. On Friday, former prime minister Yulia Tymoshenko, leader of the Orange Revolution, was moved from Kiev to a remote jail.